Sometimes I just LOVE being single, and sometimes I wish I had a significant other. someone to share the precious moments of life with. I have always wanted a significant “life partner” but my expectations have been higher than reality has brought me. During my time of being single, I have learned to be more independent, and self-sufficient than when I was with a partner. It is just a matter of survival. When you are responsible to pay all of the bills and totally support yourself, you grow up pretty fast. Especially if you have children who are depending on you. Because whether you are alone or together with someone else, your children mean everything to you. They are a reason to keep going. And then there is the fact that everyone has their own baggage. So why would I want to take on someone else that still drives around with a truck load of baggage, ready to dump it all on me? That hasn’t done the necessary work of becoming a better version of themselves. 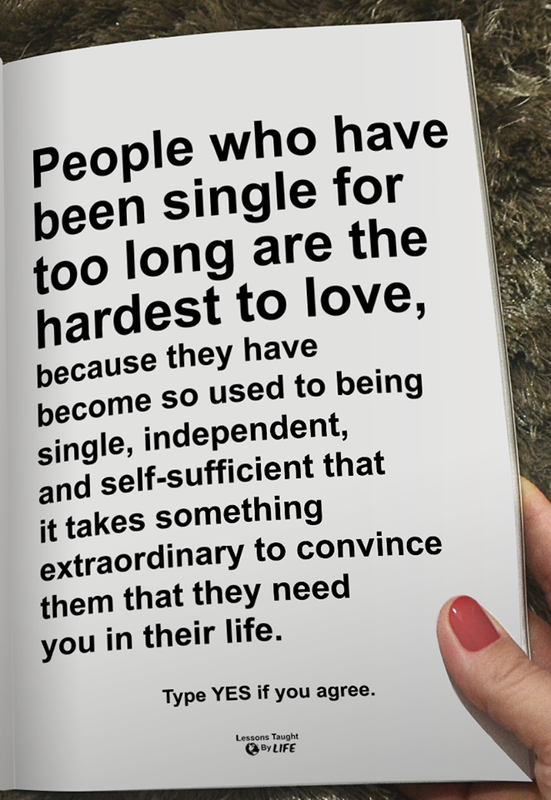 So of coarse it takes someone who is extraordinary to become a part of my life. They have to be pretty special to measure up to the standard of living I have attained myself. That doesn’t mean that I am harder to LOVE. It just means that I have my “stuff” together and I now know what I want more than ever before. So why would I want to take on someone or something else that doesn’t measure up? Love is one of the most important things in my life. 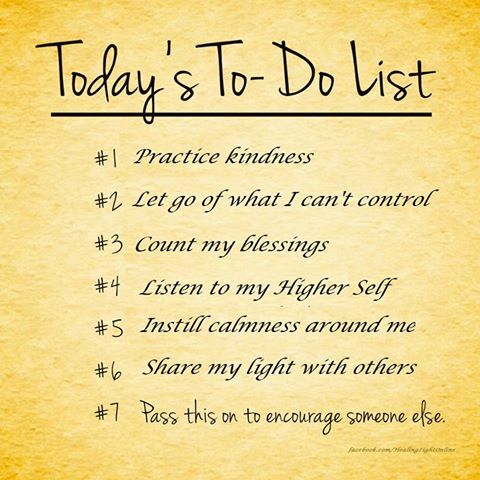 I do things every day to share and show love in many ways. I just don’t need anyone who is enforcing their version of LOVE (control) on me any more. I have found unconditional LOVE. Which means that I have learned to truly LOVE and accept myself and others as we are. Being complete in our selves but never completely finished learning and growing. Being satisfied in the now, but always seeking more. 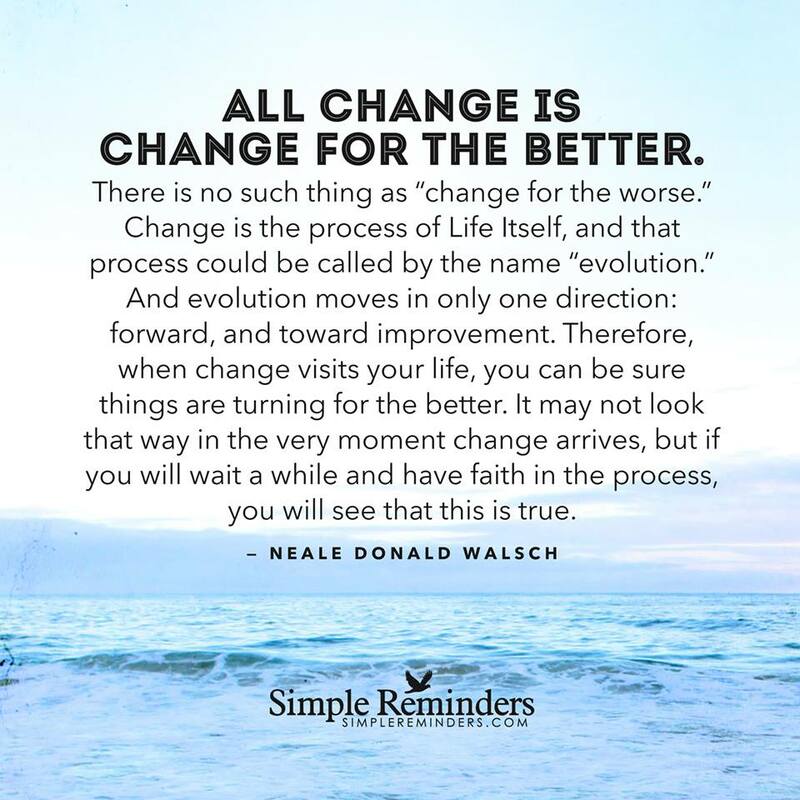 Change is the process of Life Itself, and that process could be called by the name “evolution.” And evolution moves in only one direction: forward, and toward improvement. 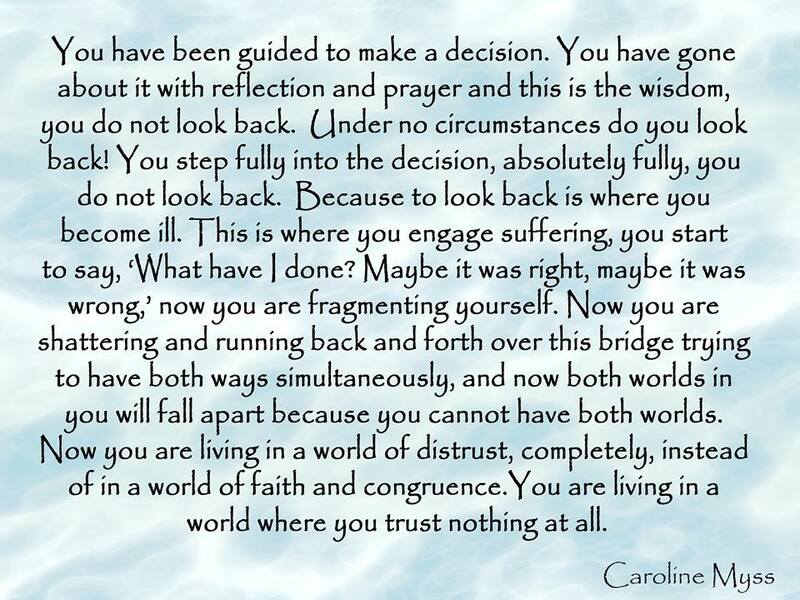 Therefore, when change visits your life, you can be sure things are turning for the better. the face of fear, pain, and stress. Have faith today. Just because. Keep persisting toward your dreams. the reason in the world to be small. Do this, just because we need you. 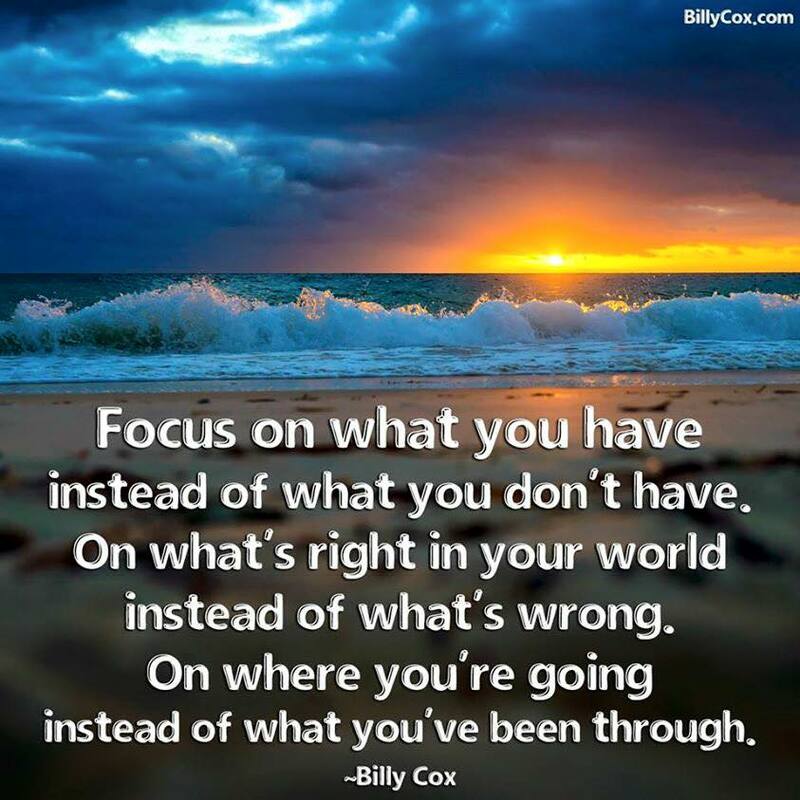 Keep up the good work of being positive and allowing yourself to grow and expand. 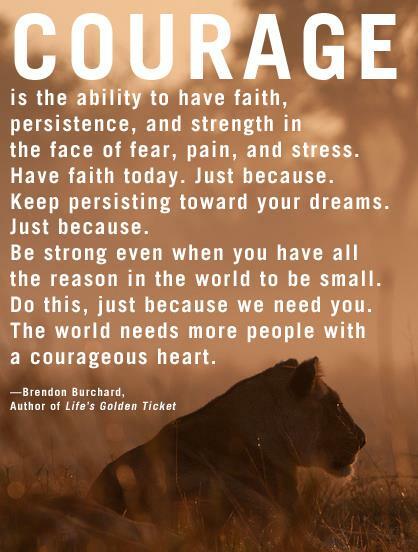 Being courageous and knowing that life is suppose to be good. It is meant to be fun and enjoyable. It takes courage to face the day if you don’t know who you are and what you are truly capable of. So face your fears and allow your life to be great. Think about great things and your life will show more great things. Relax and be easy about life. Have a courageous heart and keep going. Living the life of your dreams and deepest desires. because you are a courageous and beautiful person, full of love and compassion. We all have 24 hours each day. When we spend our time thinking about things that we think can’t happen, or won’t happen, or what we don’t want to happen, we are actually asking for more of that to show up tomorrow. When we are afraid, we are in a negative state of emotion. 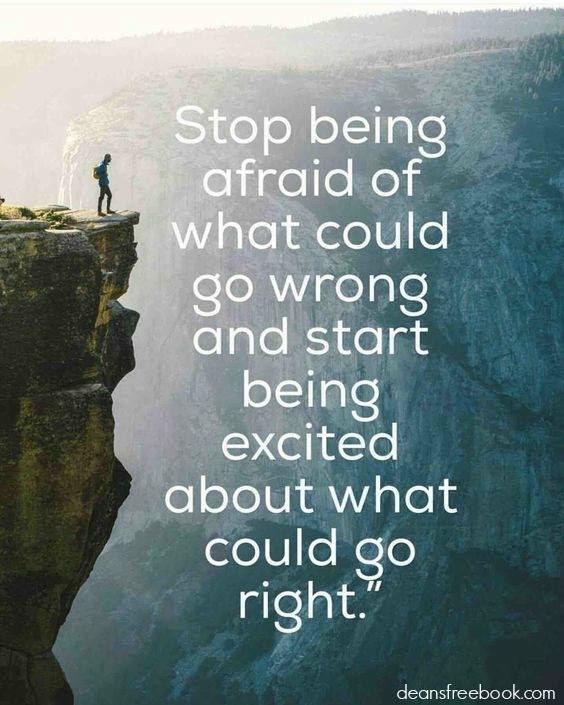 If we spend a lot of time being afraid and in a negative state, we are asking for more of the same. If we can realize that what we think about expands, we then change our thinking and start dwelling on the things that we do want to expand. Things that we can be thankful for. Things that we can be grateful for. Things that we are happy about. Get excited and live life to the fullest today! You really can’t do much about how other people react to you. Because it all depends on what kind of a day they are having. Whether they have a headache, toothache, or something else bothering them like a sliver in their finger or a painful cut on their foot. If they are having an exceptionally good day, they will likely smile and agree with what ever you have to say. If they are having an exceptionally bad day, however, they are likely to disagree with what ever you have to say. And may even react in a negative way, arguing with you no matter what the subject is about. 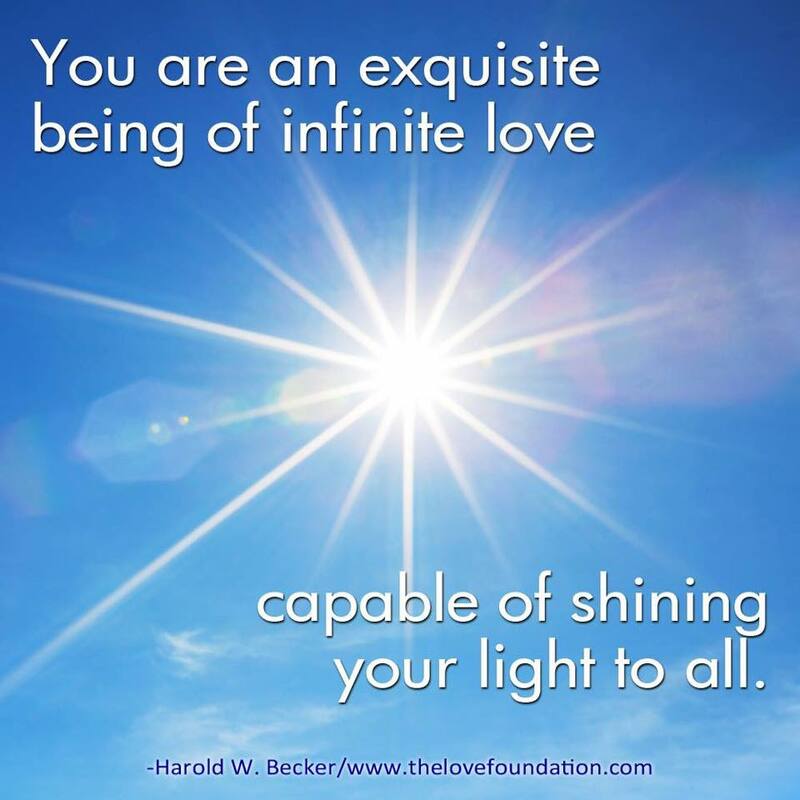 the love that radiates from inside you. The way you react is your business. The way they react is theirs. Do your best to live the kind of life you want to have. Being pro-active rather than reactive. Being as patient and loving as you can be. 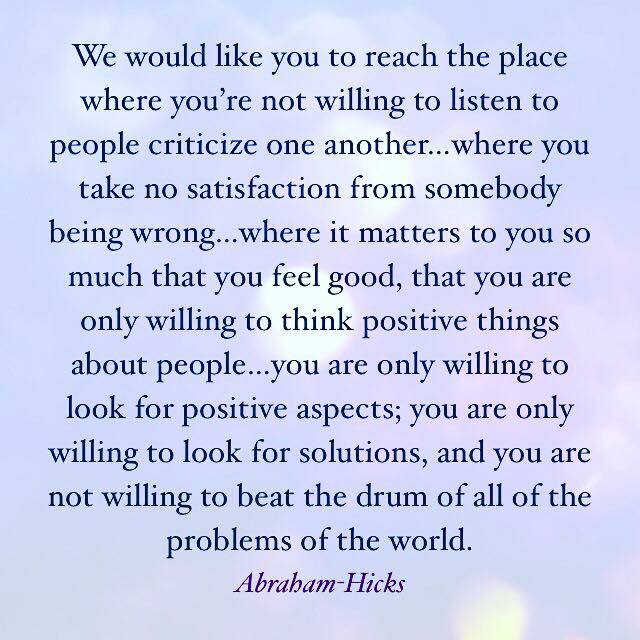 Feeling the patience you have practiced show you the way and eventually you will be at such a high vibration that you will begin to side step those people who vehemently want to disagree with you. For some reason they just stop showing up in your life. They take a different buss. They go to work a different way. They move out of the area. They come down with a case of laryngitis. Because they are looking for a fight. Some type of Disagreement. And you are looking for agreement. The two different vibrations are complete opposite and therefore oppose each other. If you keep practicing the art of LOVE and keep filling yourself and sending out LOVE, the more LOVE and loving people will show up in your life. You can actually change the friends and family you have until your life becomes the best it can be. It does take dedication and ongoing practice though. It may not happen immediately, but it does have to happen eventually because you attract what you are – like a magnet. If you are not getting what you want, then it’s time to reevaluate your own inner thoughts and beliefs so that you can line up with what you really do want. Paying attention to your highest desires. 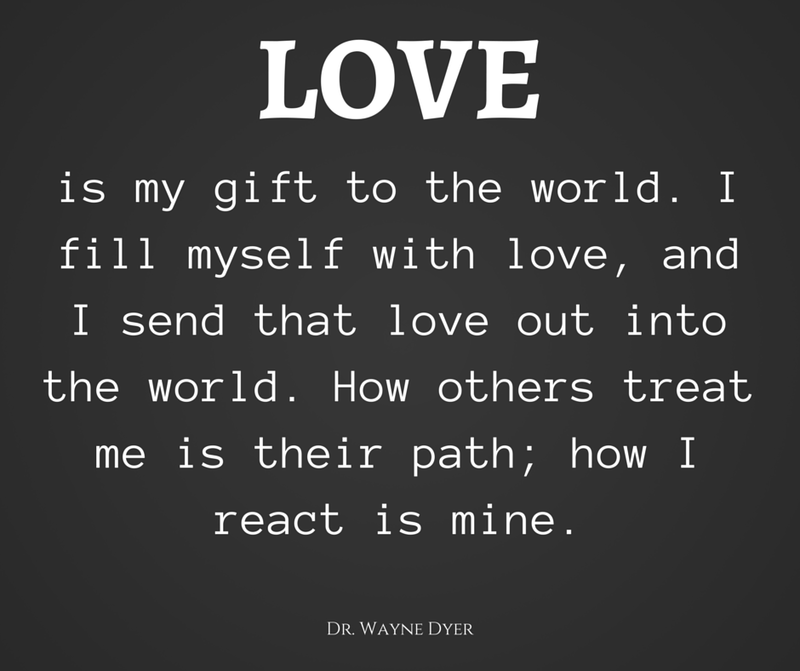 Letting LOVE be your gift to the world. 1. Don’t knock it ’til you try it. 2. Send Thank You cards for every act of hospitality – except another Thank You card. 4. Put cinnamon in you r coffee, and twice as much when you miss me. 9. 5-second rule. It’s just dirt. 14. Can’t is a cop-out. Don’t want to is perfectly acceptable. 20. Study your curiosities and practice your passions. 21. Ask for what you want. 22. Wish on stars and dandelions, then get to work. 24. Fall in love often. Particularly with ideas, art, music, literature, food, far-off places and four-leggeds. 31. You are amazing! Don’t let anyone ever make you feel you are not. If someone does… walk away. You deserve better.